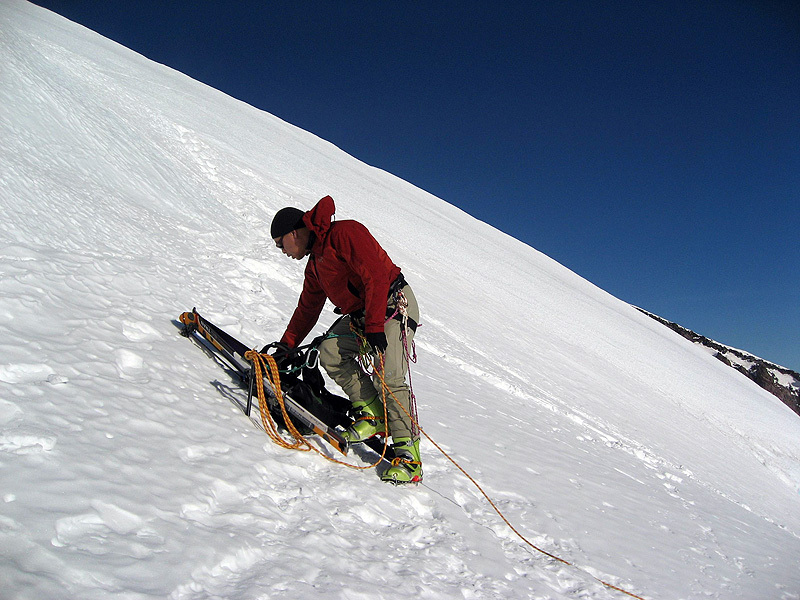 After getting shut out on Baker the previous month, Kevin was looking for a window of good weather for a June trip. As it turned out, there was a Tuesday-Wednesday bright spot on the 19th and 20th of June, and he gave me a call looking to do an overnight. 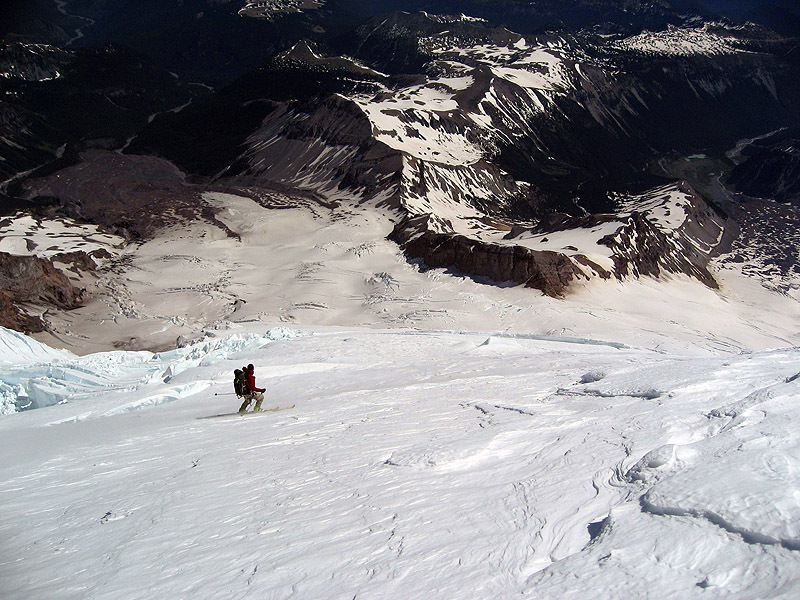 Calls to some of the usual mid-week candidates didn't yield a third party member, so it was just the two of us for a try at the Emmons/Winthrop route up Rainier. 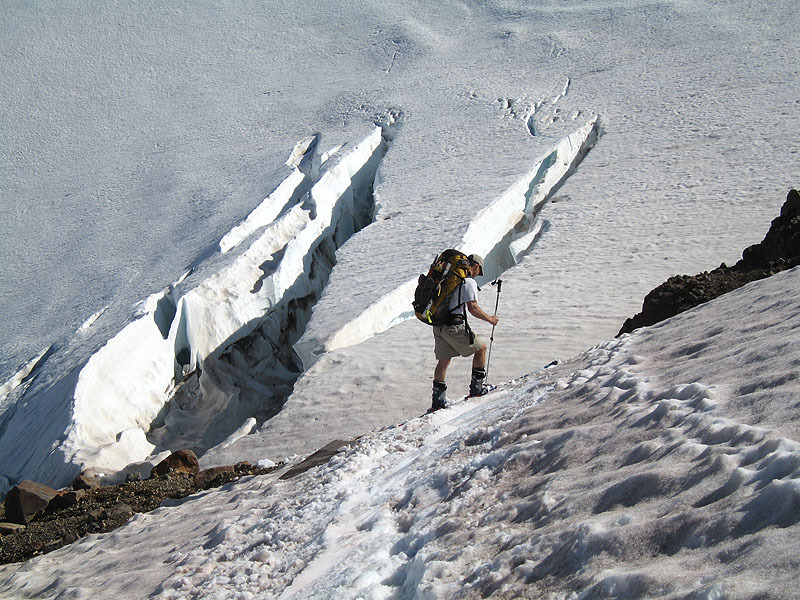 We pulled into the White River Ranger Station around 11:30 AM, long after most of the other climbers had signed in, and learned that there were 42 people with reservations at Camp Schurman and another 2 at Emmons Flats. We picked up our annual climbing passes and permit for the route and headed for the White River Campground. The information on Mike Gauthier's blog was completely accurate. We hadn't been up the Glacier Basin trail this year, and the bottom two miles, which was wiped out in the floods of last fall, has been temporarily re-routed in a makeshift fashion to allow access to the Interglacier and climbing routes. Though the recommendation to add 1 to 2 hours to your schedule to hike in is a little generous, the rock hopping and blowdown (washdown?) straddling definitely gets tedious and adds a good half hour to the walk. The weather was perfect - brilliant sun with a little breeze. We arrived at the bottom of Glacier Basin and decided to stay climber's right and ascend the long finger of snow we had skied in previous years rather than waste time trying to figure out how to cross the stream without getting wet. It always feels good to start skinning after a few hours of sweaty hiking with heavy packs, and this trip was no exception. Corn softened to just the right consistency provided good grip up the Interglacier, and we rounded the corner to see the lower Emmons shimmering in the afternoon sun. 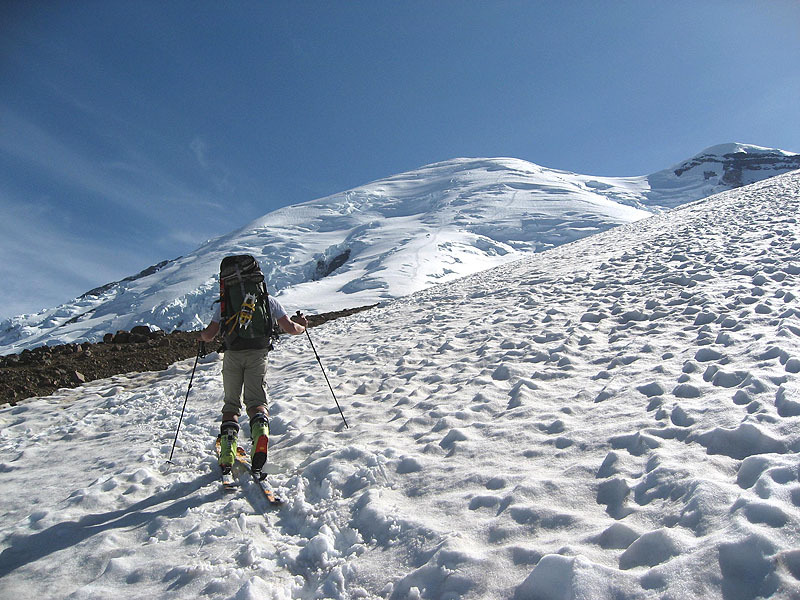 A quick descent, then a brief skin up to Camp Schurman, where we found (as expected) vitually every square foot of flattish space anywhere near the toilet filled with some sort of tent. Since the ranger at White River had said there were only two people camping at the higher Emmons Flats bivy site, we headed on up and threw down the bedding. There was plenty of time to bask in the sun and melt a few liters of water; a bit later the other two campers showed up and turned out to be a couple of guys we had passed on the way up wearing full fleece balaclavas. We asked what was up wit' dat and they admitted to having forgotten to bring any sunscreen. One guy was wearing his Scarpa T2 tele boots. When asked if they were comfortable, he said they were, but "the duckbills were a bit of a problem" hiking in the 4 plus miles over rocks and trees. Ouch. We woke up at 3:00 AM and saw a bunch of headlamps already well above us on the route, but reassured ourselves that we were skiers and that a 4:00 AM start was plenty early. Remembering the perfect snow consistency the evening before and the forecast for 11,000 ft. freezing levels, we set up the skins and ski crampons, determined to skin as far up as we could. Unfortunately, it had frozen hard and it became obvious after about 800 vertical feet that it would be better to just walk. As soon as we joined the main climbers route, it became apparent that we were in for a long morning of unpleasant slogging. 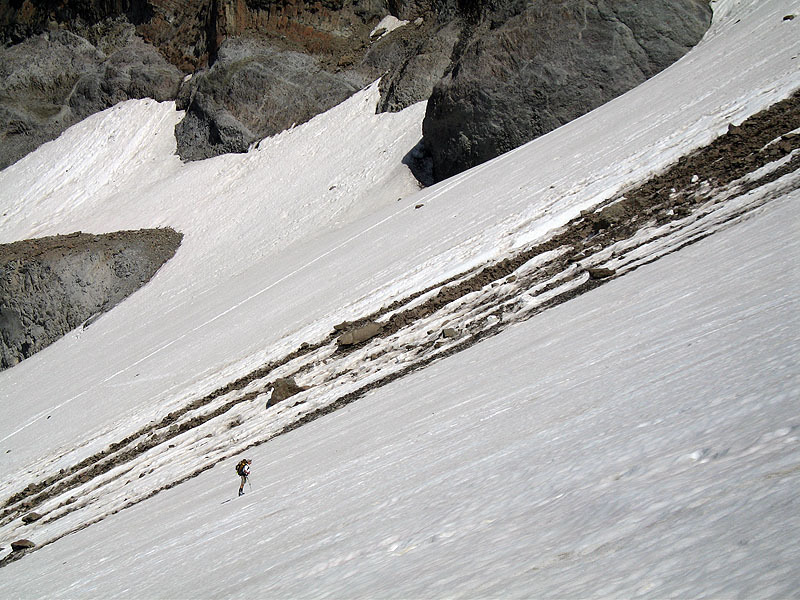 None of the climbers who had preceeded us on the route seemed to have any idea how to walk - steps had no rhythm or uniformity, no one had bothered to kick flat steps in the steep sections, and the angle of the footprints went every which way. On top of that, the snow surface was as hard as the Alpental parking lot on a 25 degree Saturday morning. My calves are still aching. 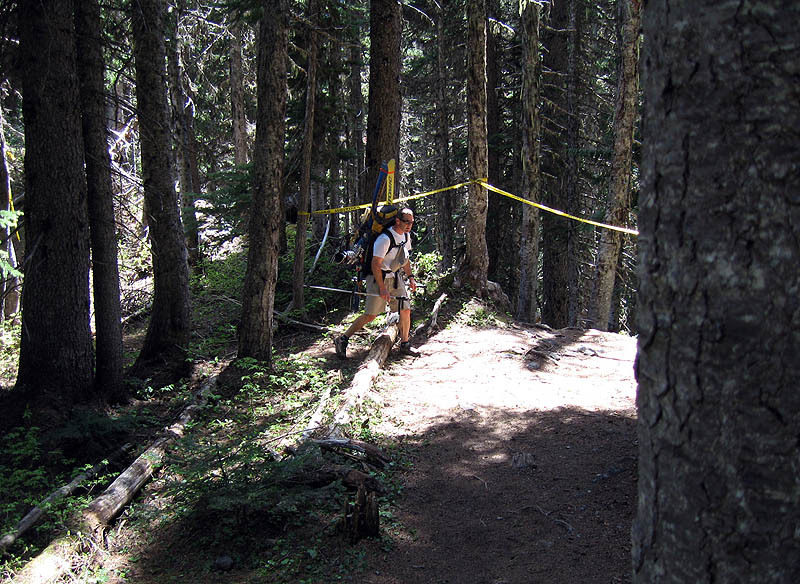 We continued to follow the climber's route, traversing over at about 11,500 ft. and passing a few people in the process. The two crevasse crossings mentioned by Gator were interesting - the party ahead of us had evidently jumped the lower one, which looked a bit sketchy to me. We did an end run, which only took us 100 yards or so out of our way. 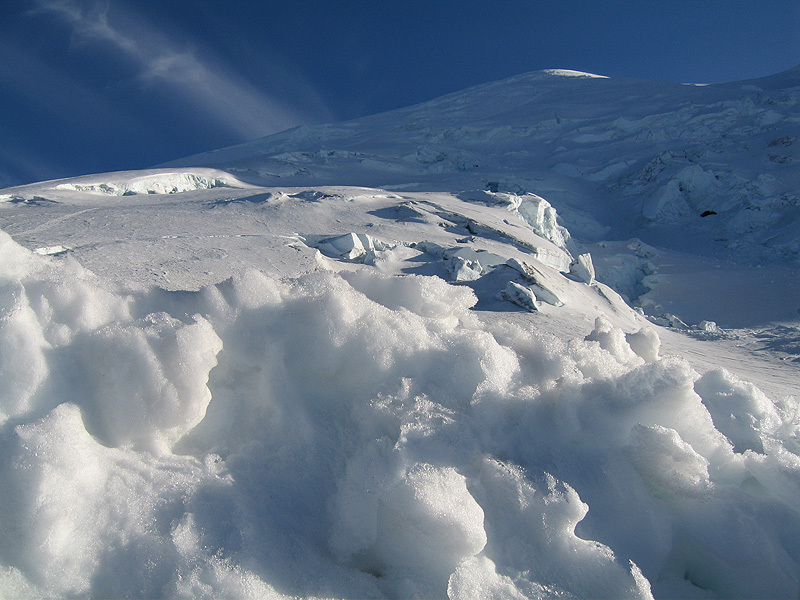 The upper one had a usable snow bridge, but several holes revealed a huge crevasse underneath, and a few more days of warm weather could change the situation quickly. The track also got softer and more regular as we got higher, and both Kevin and I were pretty happy with our fitness considering neither of us had been doing anything special for conditioning. 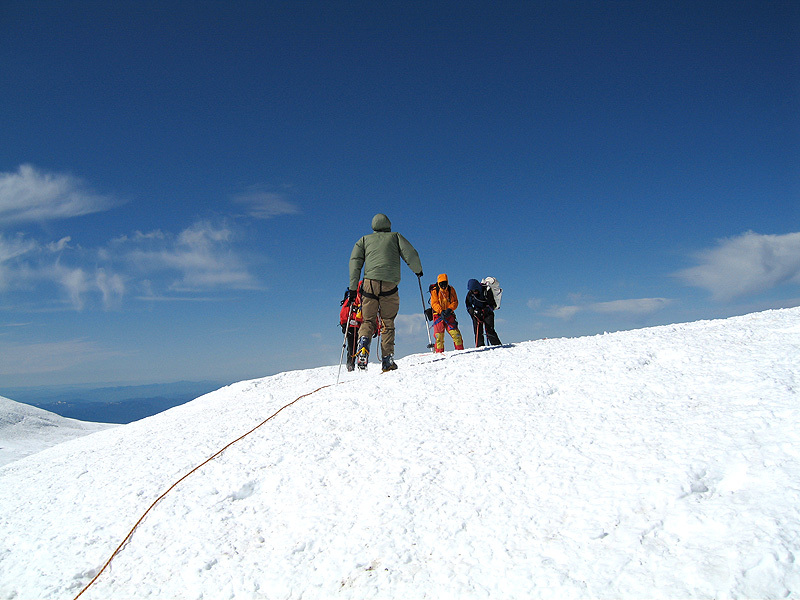 The wind kicked in as we got above 13,000, and by the time we hit the summit, it was howling and cold. No one was in the mood to linger on the top, so we exchanged cameras with the group of three that had been just in front of us, shot pictures of each other, and beat it. We actually didn't ski from the top, since we felt the need to descend about 100 ft. to get out of the wind and de-skin. Setting off into a sandblast-effect, we gingerly crossed ugly frozen sastrugi for the first 1,000 ft. and circled around the summit cone onto the upper Winthrop. Unfortunately, the skiing here wasn't any better - rock hard frozen corn interspersed with queenbed-sized potato chips of wind blown crust trying to knock the skis off your feet didn't do much for our ski style as we gazed at the yawning mouths of large crevasses a few hundred feet below. 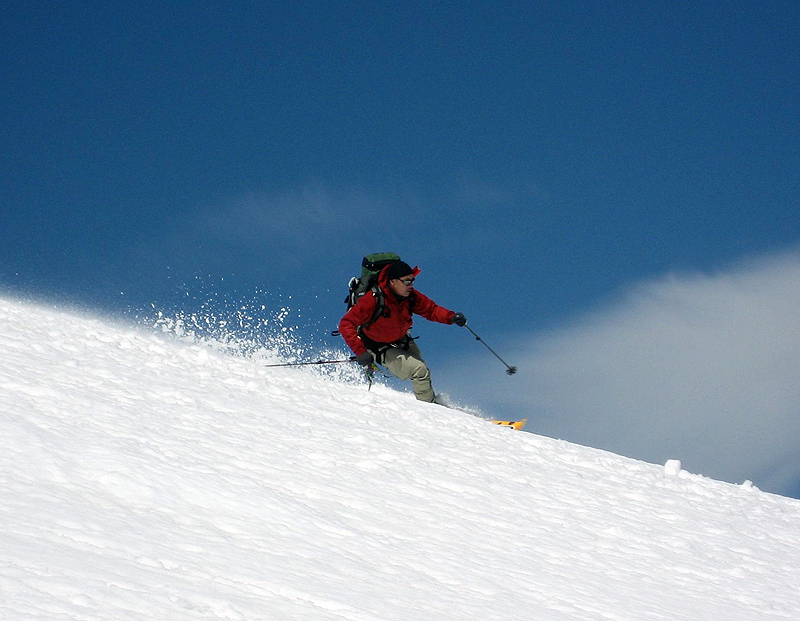 We skied deliberately for a while to skier's left of the climbing route, then traversed over to the Emmons. 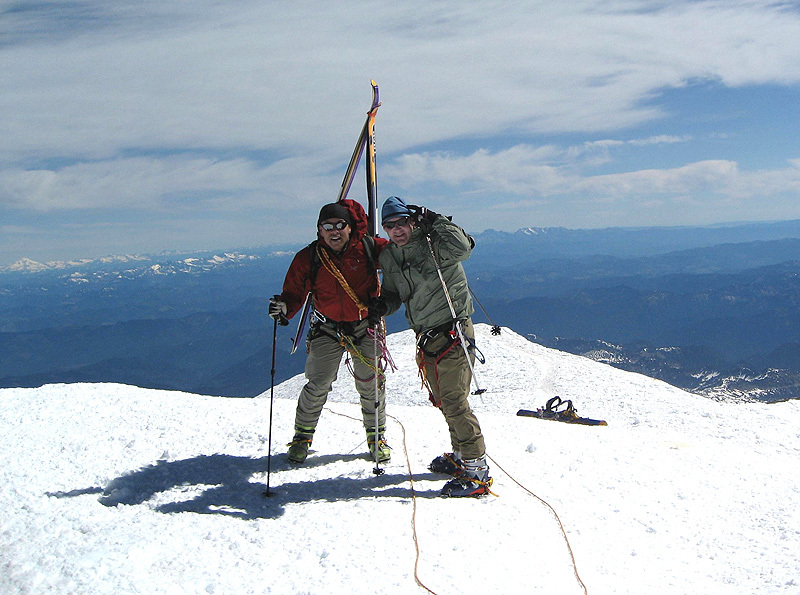 Somewhere between the summit and Schurman my red Yates cable picket jumped out of my pack and made a bid for freedom. It has "Louie" scribbled all over it in black Sharpie-script - if you happen upon it, shoot me an e-mail by clicking on the link at the bottom of the page, or use it yourself. 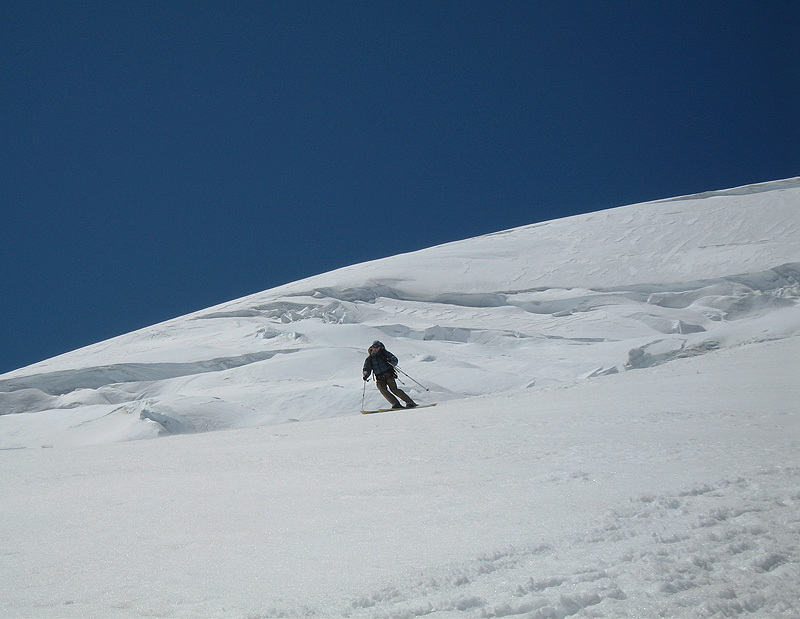 The only really good skiing of the day was the short 800 vertical feet leading down into Camp Schurman. There the sun-softened corn was perfect and fast, and I'm sure we impressed the hoardes of campers hanging out and practicing their climbing technique. We steered straight for our bivies and took a quick nap, then packed up our stuff and headed for the Interglacier and the hike out. I'm sure they added a couple of miles and numerous rock obstacles to the trail during the night for our recreational pleasure, but we emerged unscathed at the White River Campground and drove directly into Enumclaw for burgers at the Mint.